Toxic fire effluents are responsible for the majority of fire deaths, and an increasing large majority of fire injuries, driven by the widespread and increasing use of synthetic polymers. Fire safety has focused on preventing ignition and reducing flame spread through reducing the rate of heat release, while neglecting the important issue of fire toxicity. This is the first reference work on fire toxicity and the only scientific publication on the subject in the last 15 years. Assessment of toxic effects of fires is increasingly being recognised as a key factor in the assessment of fire hazards. 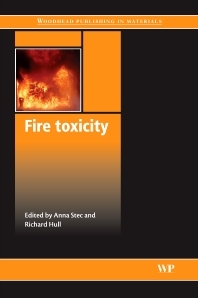 This book raises important issues including the types of toxic effluents that different fires produce, their physiological effects, methods for generation and assessment of fire toxicity, current and proposed regulations and approaches to modelling the toxic impact of fires. The contributors to Fire toxicity represent an international team of the leading experts in each aspect of this challenging and important field. This book provides an important reference work for professionals in the fire community, including fire fighters, fire investigators, regulators, fire safety engineers, and formulators of fire-safe materials. It will also prove invaluable to researchers in academia and industry. Part 1 Introduction: Introduction to fire toxicity; Fire scenarios and combustion conditions. Part 2 Harmful effects of fire effluents: Hazards from smoke and irritants; Asphyxiant components of fire effluents; Effects of fire effluents on fire victims. Part 3 Biological assessment of fire toxicity: Experimental methods in combustion toxicology; Animal exposure studies; Application of human animal exposure studies to human fire safety; In vitro biological toxicity assessments for fire combustion products; A combined fire smoke and lung model test equipment. Part 4 Toxicity assessment using chemical analysis: Sampling and measurement of toxic fire effluents; Bench-scale generation of fire effluents; Large scale generation and characterisation of fire effluents; Effects of the material and fire conditions on toxic product yields; Estimation of toxicity during burning of common materials. Part 5 National and international fire safety regulations: Prescriptive regulations and tests considering the toxicity of fire effluents; An international standardised framework for prediction of fire gas toxicity. Part 6 Numerical simulation of fires and their hazards: Computer simulation of fire hazards and evacuation; Toxic hazard calculation models for use with fire effluent data; Modelling fire growth and toxic gas formation. Dr Anna Stec is a lecturer in Fire Chemistry and Toxicology in the Centre for Fire and Hazard Science at University of Central Lancashire, UK. Her work has focused on quantification of toxic hazards in fires, understanding the factors that affect fire gas toxicity, and the relationship between the physiological effects of the concentration and dose of different toxicants. She has conducted detailed comparisons on the yields of fire gases and other combustion products using a selection of different small-scale fire models in order to predict the effects of fire exposures to humans. Dr Stec has been designated as the UK’s Principal Expert on fire chemistry, and an active participant at the ISO TC 92 Fire threat to people and environment meetings. Professor Richard Hull is a Professor of Chemistry and Fire Science in the Centre for Fire and Hazard Science at University of Central Lancashire, UK.. His work has focused on fire retardant mechanisms, fire effluent toxicity and fire science. With another contributor, Prof David Purser, he has been pivotal in the development of the steady state tube furnace as the first internationally recognised standard for the assessment of fire gas toxicity (ISO TS 19700); as one of the only methods capable of replicating real fire conditions on a bench-scale, this has led to its growing acceptance, particularly for performance-based fire assessment.